Home sales in December, for the sixth month in a row, continued a positive trend with 1,294 units — up 7.65% over December 2010. Annually, there were 16,829 sales in 2011 compared to 16,937 in 2010. Second half sales of 2011 were positive, making up for a difficult first half. Last month’s average price was $146,259, compared to a year ago of $160,295. The average price for 2011 was $151,384 compared to $158,560 in 2010. Today, the average interest rate in Cincinnati is 3.91% for a 30-year fixed rate mortgage. Nationally, the average interest rate is 4.18%. Many experts claim that the low interest rates will not last. The Cincinnati area housing market has 8 months of available inventory compared to nearly 10.5 months a year ago. A continued decrease in inventory would result in a greater demand, possibly leading to an increase in the average sale prices of homes. The National Association of Realtors claims that an inventory level of less than 6 months leans toward a “seller’s market,” where the price of homes could rise. TODAY IS A GREAT TIME TO BUY… Call a Star One sales associate for assistance in your buying or selling needs. 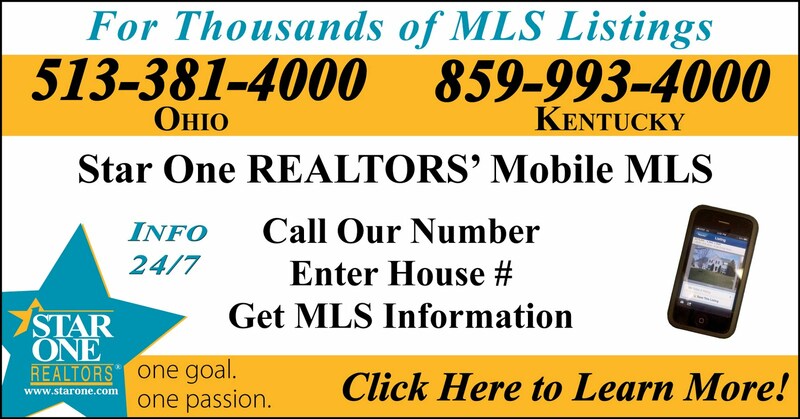 Star One Mobile MLS empowers ANYone to call from ANY phone on ANY local home for sale to find information such as price, number of bedrooms, baths and special features of the home. 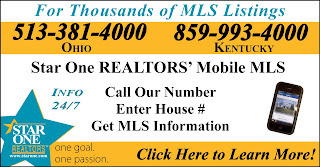 Call 513-381-4000 for thousands of listings in Ohio and call 859-993-4000 for thousands of listings in Kentucky. You simply call the number, follow the prompts and enter the house number. You will hear an audio presentation of the property’s details. The best part is, you can get instant information on any home listed with any real estate company in our local market, not just our company’s listings. You can also receive text information and email information on the property that you inquired upon so you can view photos online and keep track of the properties you have viewed.